Little dude on the tip top of Everest! This is my son on the tip top of Everest. Or, that’s how I presented this little dirt hill outside of my daughter’s school. One thing to remember is that exploring and appreciating nature doesn’t always have to be something big. You don’t have to climb Everest to admire the view. You don’t have to stand by a giant redwood to be wonderstruck. You certainly don’t need to stumble into a fairy’s cove to enjoy the small miracles surrounding us. After all, dirt hill, Everest, it’s all a matter of perspective (unless you’ve actually climbed Everest, then you could probably muster up a decent argument against this statement). 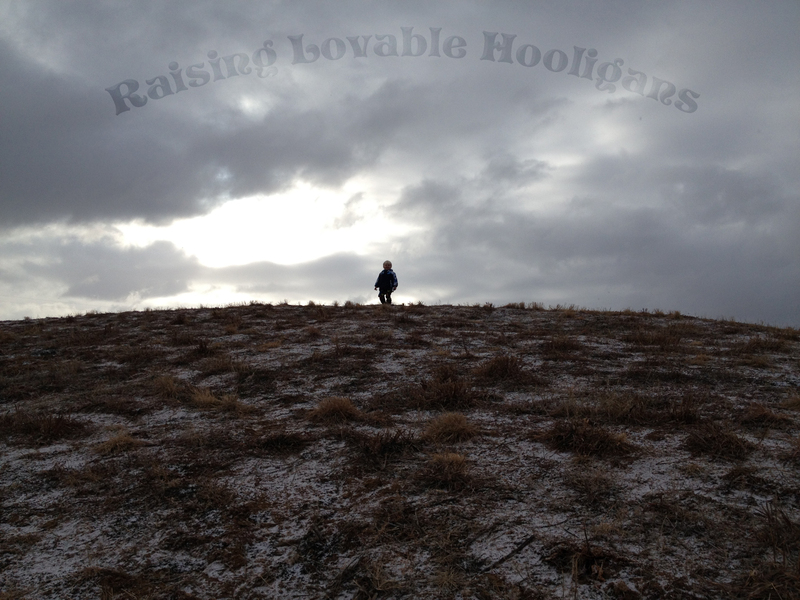 But, for those of us raising kids outside you have the power to make a mole hill feel like an amazing mountain. I’ve noticed a common thread for why kiddos aren’t taken out into nature more often. Time. The key to remember is that you don’t need a great deal of time to obtain your daily dose of nature. I can always accomplish more if I aim small. I know, I know, you’re supposed to aim big but I do better with small. If I tell myself I will take my kids outside to explore for 5 minutes it’s not uncommon for it to become 20 minutes. If I say we are going to go for a 10 minute walk it can easily turn into an hour as I relax, seeing my children explore and create games as we wander. If I tell myself I will do 15 minutes on the cross trainer, well, I do 15 minutes on the cross trainer but 2 out of 3 isn’t bad at all! And, even in busy schedules, 20 minutes outside isn’t a great deal of time and the hiccup it might cause in my timetable is well worthwhile. Alright, let’s do a real life example. Teachers LOVE real life examples! We were late getting my daughter ready for school. Strangely, on school mornings my daughter thinks moseying is moving quickly. She also deems this as the best time to pet the cats and cuddle the dog since she (please insert a very well developed dramatic flare) “won’t see them for the entire day!” These mornings are also ideal for rearranging her toy horses, putting Mulan to sleep and propping Rapunzel up so she can read during this long and trying separation. So, I throw on clothes and a hat to hide the fact that instead of showering I was finishing the last chapters of The Book Thief (which could also be the reason we’re running late). I throw boots and a jacket over my son’s footsie PJs and the 3 of us fly out the door. After sneaking my daughter into her already moving line I take a deep breath. Made it. Sensing my transition from focused to relaxed my son starts running up and down the schools front yard. I stand for a moment and take in the morning. It was cold until the breeze changed it to biting. A morning where you wish you had worn earmuffs or that you owned earmuffs. The sky was a blanket of gray with sporadic glimpses of sunlight. Making the light shadowed and dusky. The ground held the remnants of a few days old snowfall with random mountains, still climbable, thanks to the city’s snowplows. I didn’t really want to go out and enjoy nature with my little guy. First of all, I’d just finished a book and after I finish a book I get a little depressed, like I just said goodbye to a good friend. Second of all, it was chilly and I really just wanted to cuddle up inside, perhaps with a new book! And, third of all, there were a million things I needed to do around the house. I probably wouldn’t do them but they were certainly there. Seeing what we can see from the top. So, I figured I would try to get a little nature outing in so I wouldn’t feel guilty later in the day. On the way to the car I noticed a hill that overlooked the parking lot. Score. I enthusiastically redirected my little dude and made a big deal about going to the top of the hill to see what we could see. When we arrived at the top his smile was wonderful. We talked about all the different things we could see from the top of the hill that we couldn’t see from the bottom. We looked at the roofs of cars in the parking lot to the length of hogback that resides behind the school. We looked at the clouds and talked about how the sun was behind them, sneaking it’s light through where it was able. We talked about snow melt, how different areas still had a lot, some had a little and some had none at all. 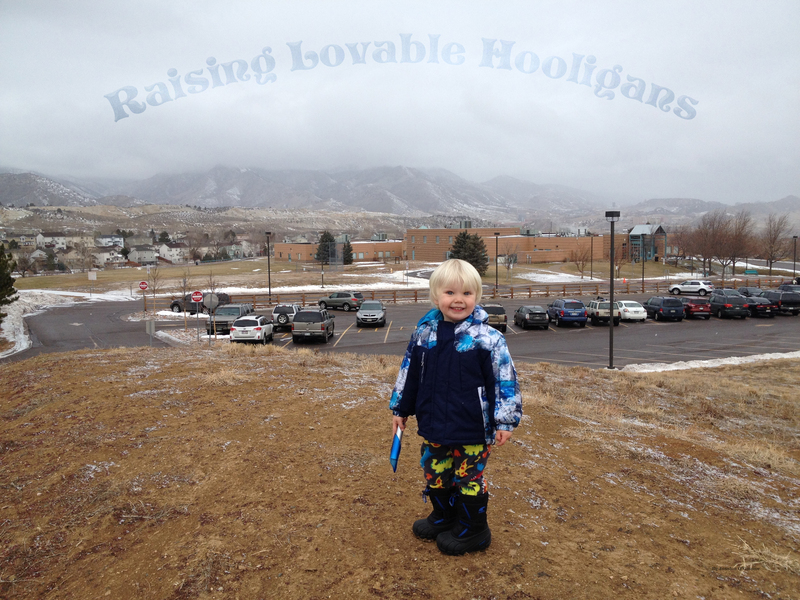 He excitedly looked and noticed and commented on all he could see from the top of the hill. Then, he started looking at the hill itself. 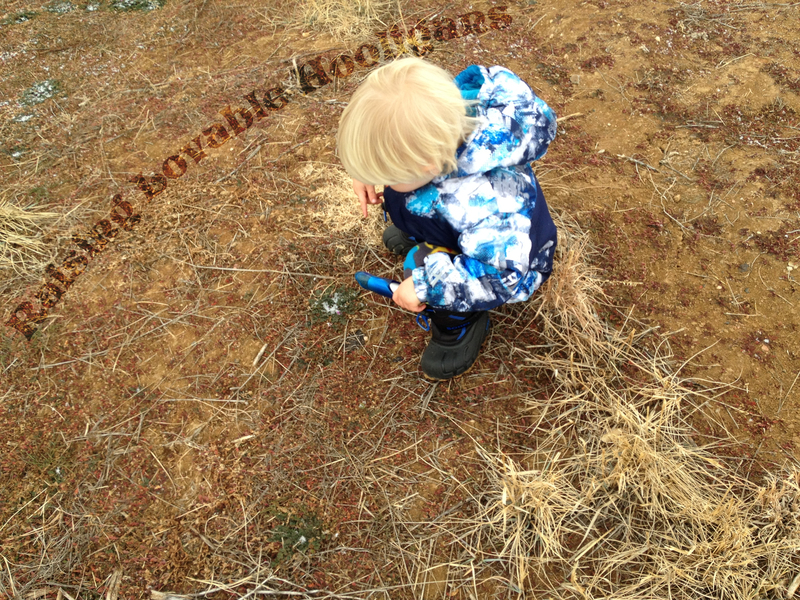 He walked around and touched what remained of the snow. He found small purple flowers growing even though it’s so cold out. He discovered that some areas were muddy and others were just hard. Then, his imagination kicked in and that is always amusing. In his little head we were in the ocean and the purple flowers were submarines. We had to swim through the water without touching the submarines. How his little brain went from a mountain top to under the sea I will never know but he saw something magical in his mind. Something he wouldn’t have seen if I’d run back to the car and driven home. We were on top of our Everest for about 20 minutes before he started really feeling the cold. As mother of the year my 2-year-old didn’t have real clothes on, mittens or a hat and, as I stated before, it had gone from cold to biting! So, we swam to the car watching out for submarines on the way. I took off his boots, now covered in mud. I scraped my shoes off smiling at the fact that my husband would come up with some smart aleck comment about all the mud on the floor. And we drove home. Both of us were chilled, relaxed and a little bit happier than when we left. This entry was posted in Nature Snapshots, Nature Stories and tagged Daily Dose of Nature, Nature Snapshots, Time. Bookmark the permalink. Sissy, you have done wonders! I was on Everest with you and Declan!